One of the things that Architeuthis needs more of before we leave is storage. Some of the Mariner 31s came with storage built into the port side area but ours wasn't one of them. I'm going to build a storage area there and I'd like it to look somewhat original. The interior woodworking on Architeuthis is beautiful. That's good because it's nice to look at but it's bad because I have to live up to some pretty high standards when it comes to modifying things. If Architeuthis was a Hunter (modern mass produced sailboat), I could just slap something together out of cheap pressboard and woodgrained vernier and it would fit right in but that sort of construction would be a slap in the face to the carpenters that built Architeuthis back in 1968. I'm a novice at this whole carpentry thing so I'm not sure I'm really going to live up to the standards those guys set but at least I'm going to try. I went to Woodcraft in Ventura and bought a bunch of African mahogany because that's what the rest of the interior is made of. It's not cheap. 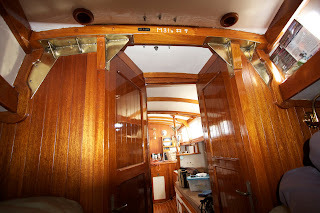 I looked at photos of the storage areas in other Mariners that were blessed with them and drew up plans for doors that would look similar when finished and were sized so that they would fit into my overall plan. That first photo up there is the mahogany I came home with before I started chopping it up with my bottom of the line Craftsman table saw. After learning to use my new dado blade, I ended up with what you see to the left. 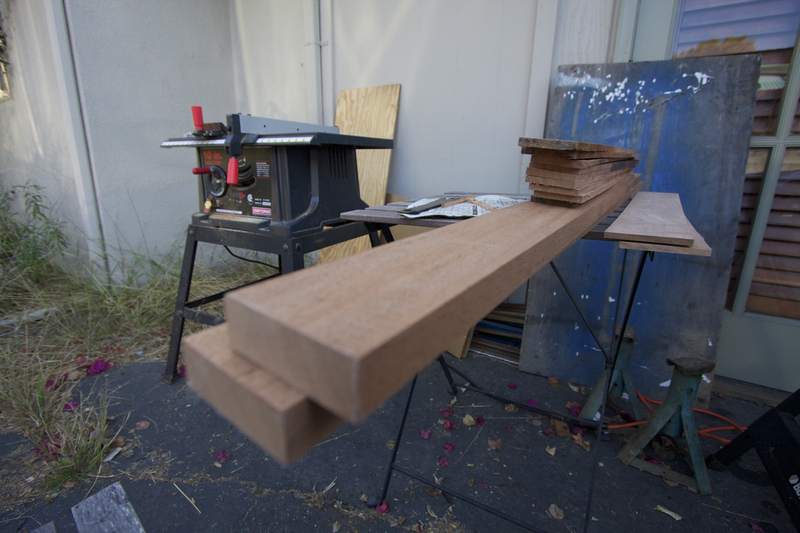 I actually managed to make some tongue and groove joints and things were more or less fitting together. I could have pretty much stopped right there and glued those pieces together but all of the interior doors and hatches have fancy little decorative bevels. 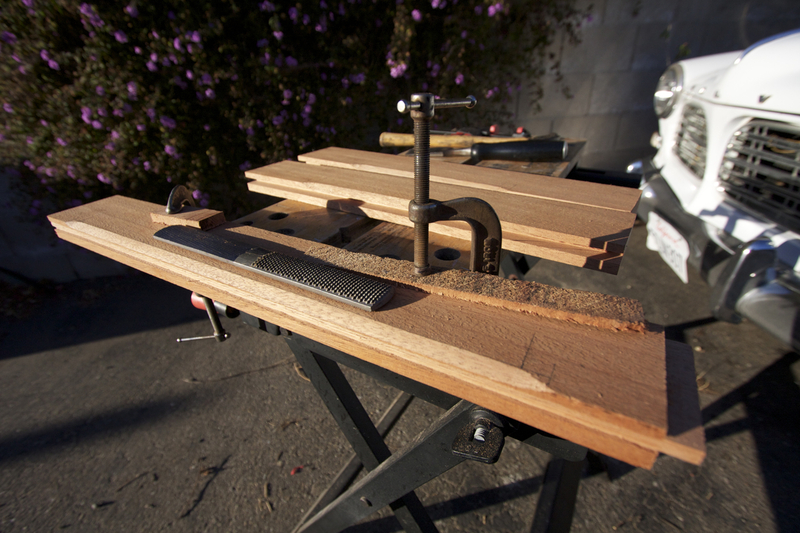 The original bevels were probably done with a router but I don't have the appropriate router blade and I don't have a router table so I had to go old school and use a rasp. 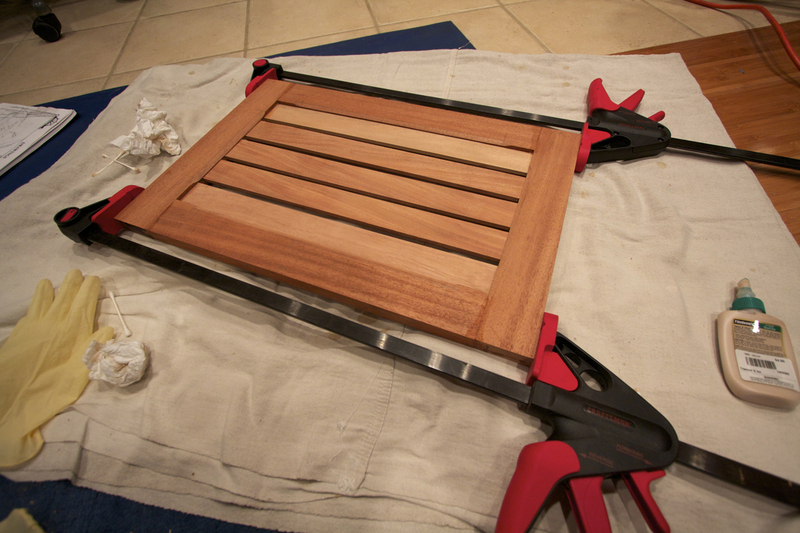 Once that was all done (and that takes a while), I cut some tiny little rectangles of mahogany to glue into the grove and force all the slats to be evenly spaced. Then, this evening, I put down a drop cloth and glued the whole door together while sitting on the floor of our very small apartment. It turns out that one of the sad ironies of this whole saving money to go on a long boat trip thing is that you really really want to have a nice garage / workshop to do all the work that you need to do to prepare but, because you're trying to save money, you can't have one. So I end up with a table saw in my driveway and tools strewn all over our super small apartment. ...but I digress. 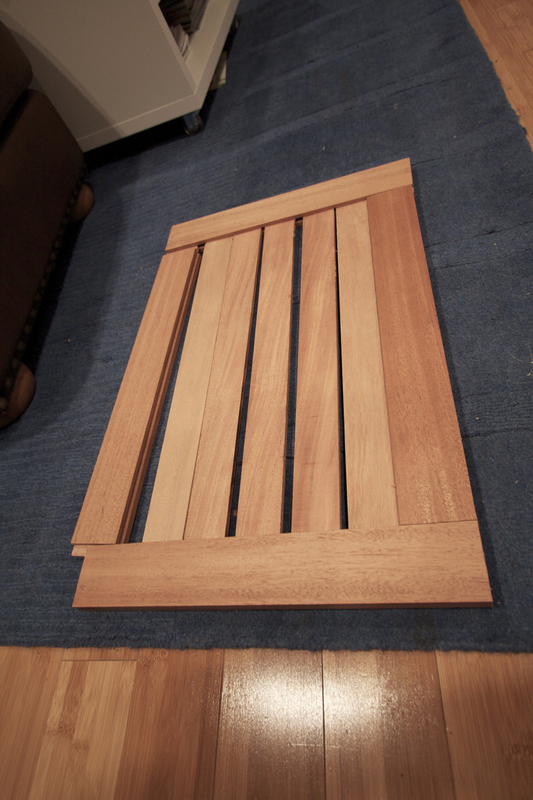 So anyway, it's all glued together now and it looks like it could turn out to be a pretty nice door. Now I just need to build another one just like it and, of course, build the cabinet deal that the door will attach to. I kind of enjoy doing this kind of stuff but it takes a long time. I sort of envy people with more industrial looking boats. It's a lot less time consuming to build function when you can ignore form. I'm trying to build something that won't look out of place on this boat. The "Door Fronts" look fantastic! You work is a real tribute to your Grandfather, and is every bit as good a job as he would have done.